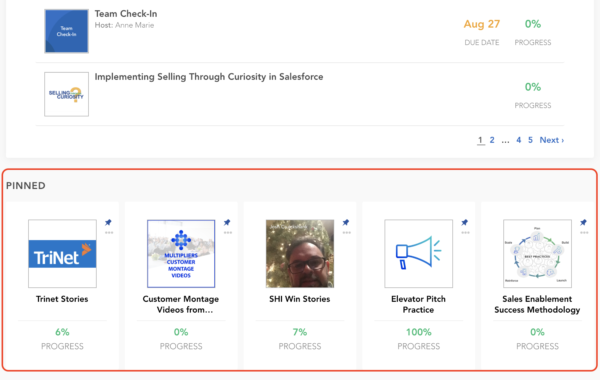 This article describes how items are sorted and how they appear on the SalesHood Homepage. To Do Tab: Contains Pitches, Huddles, and Learning Paths you’re assigned to or are participating in. Completed Tab: Contains all of the events you’ve completed from recently completed to oldest. Hosted By Me Tab: Contains all of the events you’re hosting from recent due date to oldest. Assigned Pitches, Huddles, and Scheduled Learning Paths appear at the top sorted by due date, most overdue to due furthest in the future. If you are assigned to an event that is also Pinned, it will appear in your To Dos. Self – Paced Learning Paths appear below this sorted by assigned date (assigned furthest in the past to assigned most recently). Open events you have participated in appear below this sorted by participating date (most recent first). Assigned events are removed from your To Do list after 30 days of inactivity after the due date has passed. Self – Paced Learning paths are removed from your To Do list after 30 days of inactivity. Open events are removed from your To Do list after 7 days of inactivity. Due dates are Green when >7 days in the future, Orange when <=7 days in the future, and Red when overdue. Displays events you’ve completed in completed date order (most recently completed first). Shows all events you’re hosting by most overdue to due furthest in the future. 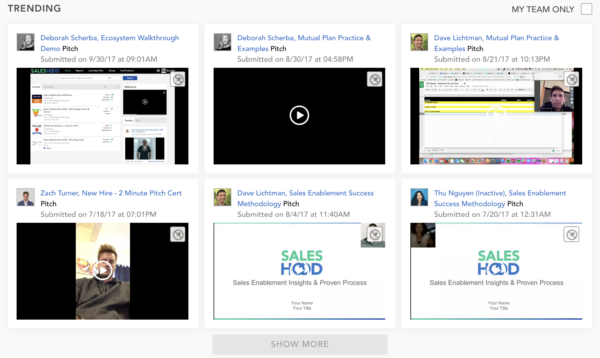 Self-Paced Learning Paths and Open Pitches/Huddles display below scheduled events by date you were added as the host of the event. Events that are 100% complete by all participants move to the Completed Tab. This tab only appears if you’re hosting any events. This is the default tab for Coaches and Publishers. Shows pinned events and files in updated date order starting with most recently updated. Coaches see all pinned items, regardless who pinned them. Pinned videos appear at the top of the list by pinned date (not affected by views or the 7-day rolling updates).